Storms blow through and trees come down. I live next to a small forest and some of the trees there bend mightily when the winds whip through. I’ve listened in the night through the storm for the sound of a crack and wait, not for lightning, but the crash…. It happened in a flash – lightning, crack, crash. 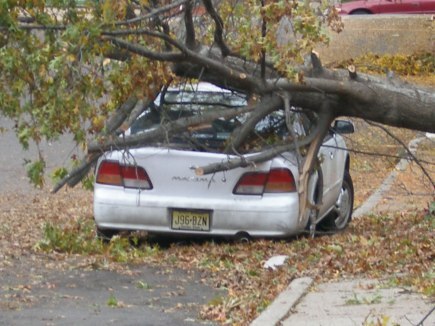 Brittle with age, the oak tree snapped at the base, smashing the parked car. No magic genie appeared to write the insurance claim, no one showed up to claim the car at all. A crew came to clean up the mess, towing the car away. It took another few days before the neighbors noticed the smell. The coroner figured she died the night of the storm, a heart attack. “Wish I’d taken the time to get to know her – seemed like a nice woman.” Lost in a flash, another good neighbor gone forever. Zoinks! This a heavy one. Very sad Erin. Although there’s not much in the way of visual inspiration in the photo, just a tree on a car, it’s amazing the different ways people have woven their stories. Well done. Thanks, Sandra. I wasn’t aware it would have such a sad ending when I started. Sometimes that just happens. Whoah. Heavy. I read it a couple of times to make sure. You plant the clues well in the beginning. Poor lady. Thank you for reading! I’m glad it worked for you. I felt it was a little spare – which you confirm with the need to reread. Yes – she was a lonely woman without much connection to her neighbors. That would be a sad way to go. An unexpected twist to your little neighbourhood tale. Nice detail. This is flawless from beginning to end. It’s also close to home…not the tree part, but recently my neighbor across the street passed suddenly. Unlike your story, she was found before decay set in. In any case, your piece makes a poignantly layered statement. Bravo! Thank you, Rochelle. I didn’t have a great feeling about this entry, but am glad that it read well for you. I continue to feel challenged by the 100 word limit – but it is a great exercise. I am now applying it to my work writing – keeping things much tighter and focused. An unexpected benefit of this personal challenge! A good friend steered me in your story’s direction. (I’d have gotten there, but more slowly and less directly.) I’m glad she did. Yours story was very simple, spare almost, yet it said so much about life and the way precious moments and great love can be lost if we don’t reach out to each other. I loved the story. Love you. And love what you taught us all with your eloquent hundred words. Thank you, Doug. I appreciate your sentiments and agree wholeheartedly. The most important part of life are those connections that make us human. I’m glad this brought the out and I am glad you enjoyed reading it. Heh heh – Ikm going to guess you have some first hand experience with State Farm. The picture made me think of the insurance claim and the rest followed. I wonder what the story would have been if I’d thought of Geico first….. It takes more than living next door to someone to be a neighbor. You captured that perfectly with this sad piece. Very well written and I liked the irony of the State Farm motto as well. I can’t imagine being so isolated as this but I can imagine how easily it could happen.